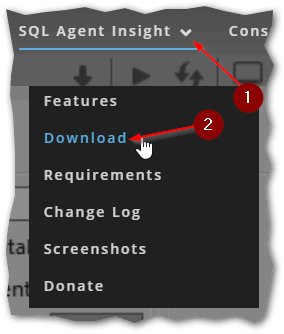 Hover over “SQL Agent Insight” (right up at the top ↑ of this page). 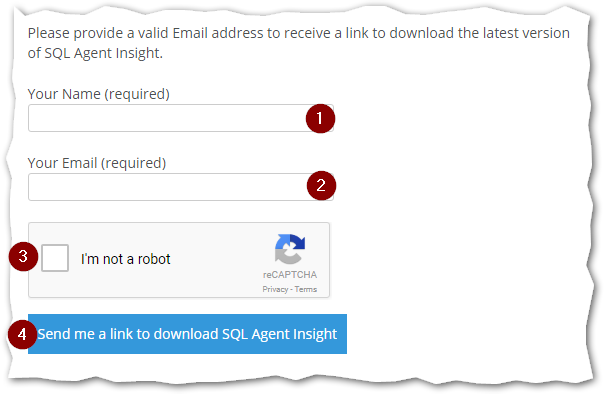 Click on “Send me a link to download SQL Agent Insight“. If all goes well, you will get confirmation on the download page that the form was correctly filled in, directly below the form. If there are any errors, correct them and try again. Please wait patiently for the e-mail. This can be delivered within 5 minutes, but depending on e-mail systems, may take up to 2 hours. Don’t forget to check your spam / quarantine folders. The first being a direct link to download SQL Agent Insight. This link will be direct to brentec.ca. The second being a link to download the SMO (SQL Management Objects) via the SQL Server Feature Pack. This link will be direct to Microsoft. NOTE: if you have been trained to not click on links in e-mail (good for you), you can always hover over the links in most e-mail software to verify their destination. Click the download link or right-click the URL and copy the hyperlink and paste the URL into a web browser session. Optionally, if you need to install the Microsoft SMO’s you can use the link provided. The SMO’s are required for some advanced functionality with SQL Agent Insight. When prompted, save the download to a folder on your computer. The file type will be a zip file, and will be named after the version number downloaded. A zip file is an archive containing one or more compressed files. 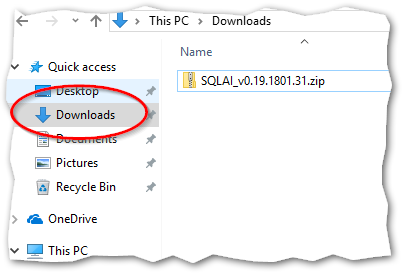 Using “File Explorer” or “Windows Explorer” (depending on your version of Windows), navigate to where you saved the SQL Agent Insight downloaded zip file. Right-click on the downloaded SQL Agent Insight zip file and select “Extract All…“. A new dialog will appear asking for the destination to extract the files. You can “Browse…” to select a new location if desired, but you can leave the defaults and then click the “Extract” button near the bottom. Wait for this to complete, and should take no longer than 10 seconds. Guess what? You just successfully installed SQL Agent Insight! 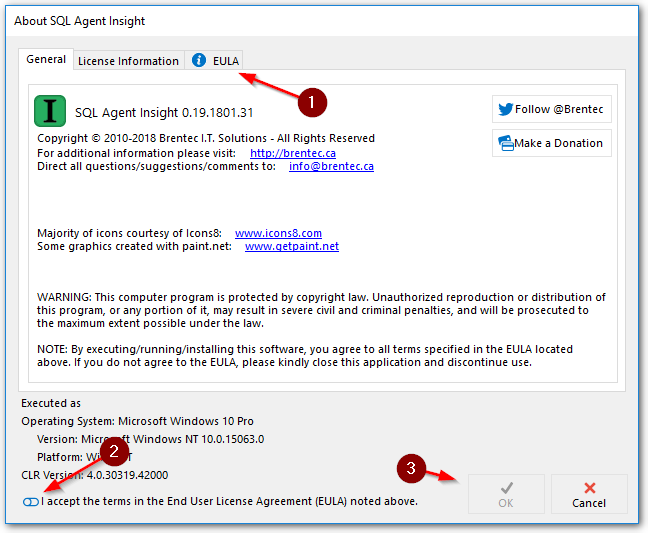 To uninstall SQL Agent Insight (why would you want to do that!) just delete the extracted folder. It is that simple. After extraction, using File or Windows Explorer, navigate to the folder that you selected earlier in the extraction dialog (if you happened to close the window). However, if you selected the option “Show extracted files when complete” during the extraction process then a new File/Windows Explorer window will open automatically showing the extracted files. Double-click on “SQL Agent Insight.exe” to run the software. When you run SQL Agent Insight for the first time, some anti-virus (AV) software may flag the file as infected. Rest assured the file is not a virus, but since there is use of some code obfuscation utilities and methods to prevent decompilation, the scanners might be picking up on that. You may have to create a rule to allow SQL Agent Insight to run successfully with your anti-virus software. Additionally, Avast AV may throw up an “unhandled exception” dialog. This is normal and should only happen once on your system. If you let Avast AV finish its scan, which can take about 15 seconds, Avast will close and restart SQL Agent Insight automatically, ready for normal use. Once SQL Agent Insight has started successfully, you should see the “About” dialog. Click the toggle to accept the end user license agreement (EULA), which will then activate the OK button. You will then be presented with the main UI for SQL Agent Insight. You will notice that SQL Agent Insight attempts to enumerate your network to find all supported and visible versions of SQL Server on the local network segment. Windows firewall blocking on the SQL Server you desire to monitor. SQL browser service is not running on the instance you wish to monitor. Windows firewall blocking on the client, i.e. where you are running SQL Agent Insight. The client and SQL Server are on different networks / vLANs. The SQL management objects installed on the client don’t recognize older versions of SQL (e.g. SQL 2016 SMO’s won’t “see” SQL 2005/2008 servers). The client does not meet the prerequisites required for SQL Agent Insight. The client is running .NET 4.x, which has been known to break runtime versions of SqlDataSourceEnumerator.Instance.GetDataSources() which is used to enumerate SQL servers on the local network. Should enumeration of your network resources be successful, all instances will appear in the “Available SQL Servers” windows in the left of the main program window. Hovering your mouse cursor over any of the instances will show the SQL Server version installed for that instance.